“FLOWER BOY: a conversation” is hosted by Jerrod Carmichael. 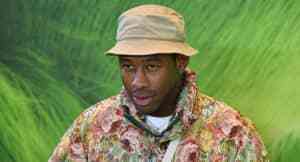 On Monday, Tyler, The Creator released "FLOWER BOY: a conversation," a discussion about his new album Flower Boy hosted by Jerrod Carmichael (The Carmichael Show). Watch the hour-long interview above. The split-screen clip is directed by Tyler under his Wolf Haley alias, and could be the only time he opens up to the public about the making of Flower Boy: "im not into the idea of interviews anymore cause theyre ugly," Tyler wrote on Twitter. "i rather do it myself ya know." Watch "FLOWER BOY: a conversation" above. Read The FADER's interview with Jerrod Carmichael here, and revisit Tyler's cover story, too. Tyler recently shared his Golf le Fleur x Converse shoe, and will soon kick off a tour in support of Flower Boy with Vince Staples.